All the pieces are in place as Mastertronic gets ready for the release of its upcoming hidden object game, May's Mysteries: The Secret of Dragonville. The puzzle game's central character is a young girl named May who's looking for her brother. Presented in a hand-drawn style, the game will task players with visiting 80 different locations across four worlds, and interacting with nearly 50 different characters as they solve various puzzles that will help them find the missing boy, and ultimately, the secret of Dragonville. With 14 different puzzle types that include the popular hidden objects format and rhythm-based games, players will have around 270 puzzles to tackle if they are to discover this secret that the game trailer keeps going on about. Mastertronic has previously published puzzle games on DSiWare ― Super Yum Yum: Puzzle Adventures and Alien Puzzle Adventure. 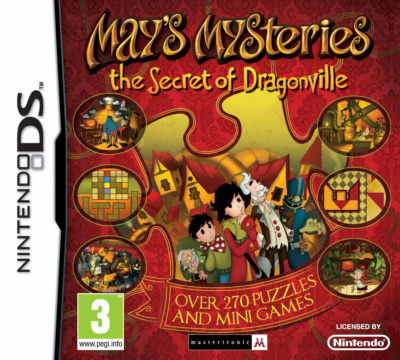 May's Mysteries: The Secret of Dragonville is scheduled for a European release on 5th August. That box art looks nothing like the Professor Layton and Pandora's Box cover. I thought Doctor Lautrec looked like a Professor Layton rip-off but this as blatant a professor Layton rip-off as you can get. May this game be any good? Edit: Having watched the video, is this just a modified Layton ROM or something? Is this Dr. Layton or what? It may be a professor Layton rip-off but it's very beatiful with great music so why is this a bad thing? The more we get such great games as this and Doctor Lautrec the better. The box art DOES look exactly like Professor Layton!!! Except this one doesn't take two years to translate. Wow, how did Nintendo approve this obvious attempt at misleading consumers? Wow... not just the boxart, but many other things are very similar. On one hand, rather depressing and a little TOO clone like. On the other, it might very well still be good, and it obviously means Layton is doing really well that other companies are looking to copy the formula. "Wow what an original game" said the kid that hasn't heard of professor layton.